I know grandmothers shouldn't compare their grandchildren. But since being around Bubby and Baby Mac the last couple of days, I've found it impossible to not compare the boys. Not in terms of bigger, bolder, brighter, or anything of that sort. This isn't a judgement, merely an observation. I'm talking here about smiles. For I truly don't recall Bubby—as full of unabashed goofiness as he is now—ever smiling as much as Baby Mac does at this age. Megan and Preston agree. 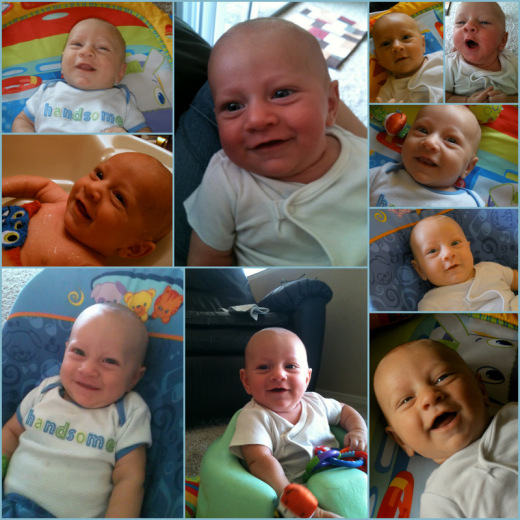 I mean, the kid is 10 weeks old and he's more full of grins and giggles than most kids twice his age. Here's a small sampling of the happy expressions I've been blessed to receive since Friday...and this doesn't even include the ones he generously doled out during the 3 a.m. feeding I covered. No, in comparison—and by comparing the pert-near thousands of photos I have of Bubby by the same age—Baby Mac clearly has Bubby beat in the smiles-per-hour category. But then again, Bubby was at a slight disadvantage: He didn't have a goofy older brother to entertain him and encourage continual rounds of grins. I can only imagine the giggles and grins we'll see from Baby No. 3. And yes, Megan and Preston plan to have more. Eventually. How could they not after giving birth to sheer joy personified? Fill in the blank: Of all the people I know, the one who most exudes joy is _______________.